Clicking Prepayments in the Loan dialog box opens the Loan Prepayments dialog box displayed in Figure 56.24. Uniform Prepayment holds the value of a regular prepayment concurrent to the usual periodic payment. Prepayments holds a list of date-amount pairs to accommodate any prepayments. Right-clicking within the Prepayments area reveals many helpful tools for managing date-amount pairs. 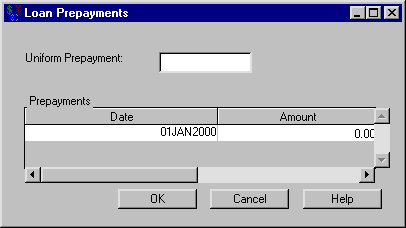 OK returns you to the Loan dialog box, storing the information entered on the prepayments. Cancel returns you to the Loan dialog box, discarding any prepayments entered since you opened the dialog box.